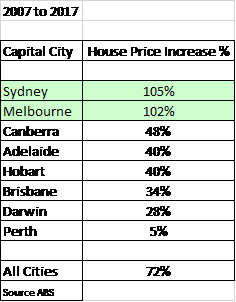 I recently conducted some research on property prices in our capital cities over the last 15 years and have come up with some very interesting results. The table below shows house price growth over the last 10 years, 2007 to 2017. As can be seen from the graph above, house prices in our two major capital cities have more than doubled. This price growth is quite extraordinary when you consider that this time period includes the Global Financial Crisis (GFC), apparently the worst financial crisis since The Great Depression. 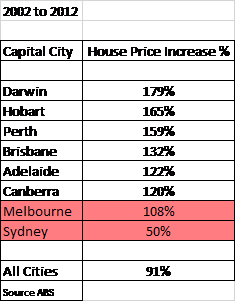 All the other capital cities are well and truly below the price growth of Sydney and Melbourne with poor old Perth only having a total 5% increase in house prices over this 10 year period. What I would like you to take particular note of is the best four performing capital cities during the 2007 to 2017 period – Sydney, Melbourne, Canberra and Adelaide. Now take a look at the table below which shows 10 year property price growth, starting five years earlier than the previous table, i.e. 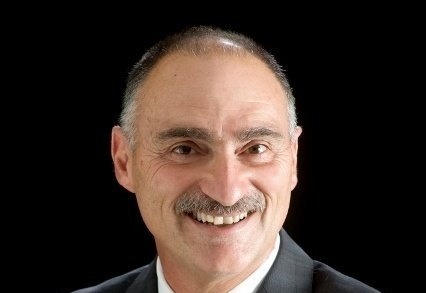 2002 to 2012. If you look at the table immediately above and compare it with house price growth in 2007 to 2017, it shows almost exactly the opposite results! Sydney and Melbourne are now at the bottom of the table and along with Canberra and Adelaide, they are the worst four performing capital cities. In this 10 year period, all the capital cities except for Sydney experienced house prices which more than doubled in value. During this time, Sydney house prices increased by only 50%. These results illustrate a key point – if you are considering holding a property for 10 years or less (which is a relatively short period of time in property terms), you must carefully time the market – it is not just about time in the market. You see, if you had bought a house in Sydney in 2002 and held it for 10 years, you would probably be very disappointed as your house only increased by 50%. However, if you bought your house in Darwin, your value increased by 179% – that is a HUGE difference. If your strategy is to buy and hold for the long term, say 20 years or more, then you can almost “set and forget” as you will ride out these ups and downs in the market and should finish well in front of those that did not invest in property. If your strategy is to pick rising markets and buy and hold for a few years, then you had better make sure that you select the right city. Selecting the right city however, is only part of the story. You also need to select the right suburb. As there are big differences in price performance between cities, there are also big differences in price performance between suburbs.